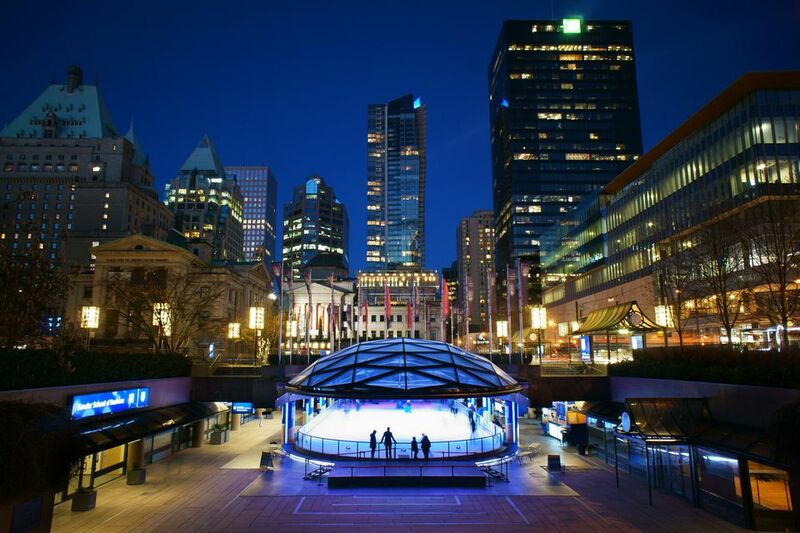 Located in the heart of downtown Vancouver, Robson Square is the city's de facto town square, ground-zero for celebrations and special events throughout the year. This is especially true during the winter holiday season when Robson Square becomes the place to be for free, all-ages Christmas and New Year's events and activities. Since its revitalization during the Vancouver 2010 Winter Olympics, when the historic Robson Square ice rink re-opened, Robson Square has played host to many of the winter season's most beloved traditions, including free ice skating at Vancouver's only outdoor ice rink. Robson Square is located at 800 Robson Street, across from the Vancouver Art Gallery. Underground parking near Robson Square is available, but it's easiest to access by public transit; it's just one block from the Canada Line Vancouver City Centre Station and a stop for many buses heading southwest and southeast. From December 1, 2018, through February 15, 2019, the Ice Rink at Robson Square will be open from 9 a.m. to 9 p.m. daily during the week and open until 11 p.m. on Friday and Saturday nights. Admission to the rink is free, but skate and helmet rentals on-site are available for $4 each. Reopened in 2000 in celebration of the Vancouver Winter Olympics, the Robson Square Ice Rink is British Columbia's only outdoor ice skating rink. Fortunately for winter guests, though, it's also sheltered from rain and snow by a glass dome that's open-ended on either side, which means visitors can skate on the rink all month long, rain or shine. For the past several years, Robson Square has hosted a series of special concerts in mid-December in honor of the holiday season. Dubbed the 12 Nights of Christmas, these free events will take place from December 13 to 24, 2018, and feature a variety of local favorites performing Christmas hits that guests can enjoy while skating at the rink. Performances typically take place from around 6:30 to 9:30 p.m. as well as on weekend afternoons. Past performers include Warren Dean Flandez, Rumba Calzada, the Showstoppers, LeftCoast Group, The Agency, saxophonist Karla Sax, DJ Dee Selectress, and Company B Jazz Band; however, the lineup for 2018 has not yet been announced. While most of the city may shut down for the Christmas holiday, you can still get out of your house even on Christmas Day to enjoy some time on the ice. The Robson Square Ice Rink will be open on December 25, 2018, from noon to 5 p.m., as will the on-site equipment rental facilities—so you don't have to worry about bringing your own skates, even on Christmas. Additionally, the rink will be open for regular hours on New Year's Day and Christmas Eve; you can also head to the Vancouver Aquarium, which is open 365 days a year. Although not technically located at Robson Square, the official City of Vancouver Christmas Tree is located in front of the Vancouver Art Gallery next door to the rink. On December 1, 2018, the city kicks off the holiday season with the official lighting ceremony, which will take place from 7 to 9 p.m. The 12th Annual Christmas Tree Lighting event will also feature family-friendly live entertainment, free cookies and hot chocolate, local food trucks, and fun activities for children as four holiday trees light up for the holiday season. Santa Claus will also be on-site to greet children and pose for photos. As part of the event, you can also join the "Buy-a-Bulb" program to donate $5 for five bulbs or $10 for 15 bulbs in order to fund the Children's Festival.